Double amputeed performance artist Lisa Bufano has turned her “loss” into a profound artistic pursuit that has made her an award winning artist. Originally focused on animation and doll making as a means to explore her body, in 2005 she turned the tables and made her body the focus of her creative expression, exploring dance and performance. 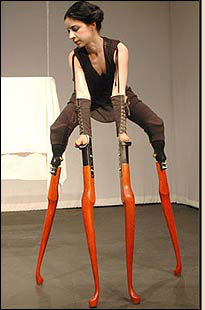 This entry was posted in disability aesthetics, performance. Bookmark the permalink.